DISCLAIMER: This chart is for information only. Always have your bindings checked and adjusted by a professional. FURTHER WARNING: This chart was copied from customer literature for the Marker M51 SC binding, which was purchased in 1996. I have been informed that this DIN chart has been superceded by a newer version. If and when I get a new chart, I will post it here. In the mean time, let the viewer beware! I - Cautious skiing at lighter release/retention settings. Skieers who designate themselves "I" must accept a narrower margin of retention in order to gain a wider margin of release. II - Average/moderate skiing at average release/retention settings. Skiers who designate themselves "II" must accept a balanced compromise between release and retention. III - Aggressive, higher speed skiing at higher release/retention settings. Skers who designate themselves "III" must accept a narrower margin of release in order to gain a wider margin of retention. Find the Release Code (letter A through O) which corresponds to the skier's weight, as well as the Release Code which corresponds to the skier's height. If they are not the same, choose the one that is closer to the top of the chart. For example if the skier's weight is 175 lbs. (code L) and the height is 5'7" (code K), choose code K as the correct line of the chart to be reading. Make the adjustments for skier type and age. The selecton from Step 1 is for an "I" type skier. If the skier is "II" move down the chart one code. If the skier type is "III" move down the chart two codes. If the skier is age 50 or over, move up the chart one code. Note and record the final Release Code letter for the skier. 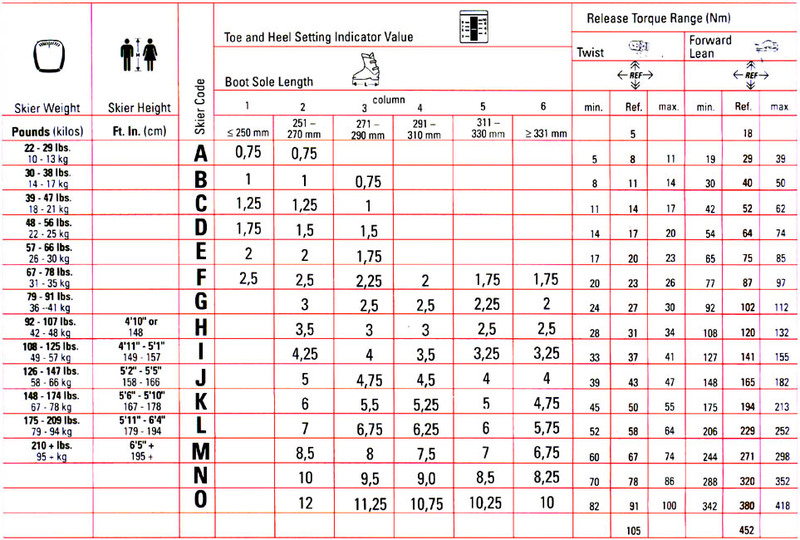 Reading on the corrected release code line from Step 2, find the column with the skier's boot length. Within the box which corresponds to the skier's Release Code and his or her boot length is a number. This is to be used as the DIN setting for the toe and heel bindings. For you professionals who have a jig for measuring binding release forces, and you've misplaced your chart, click here. 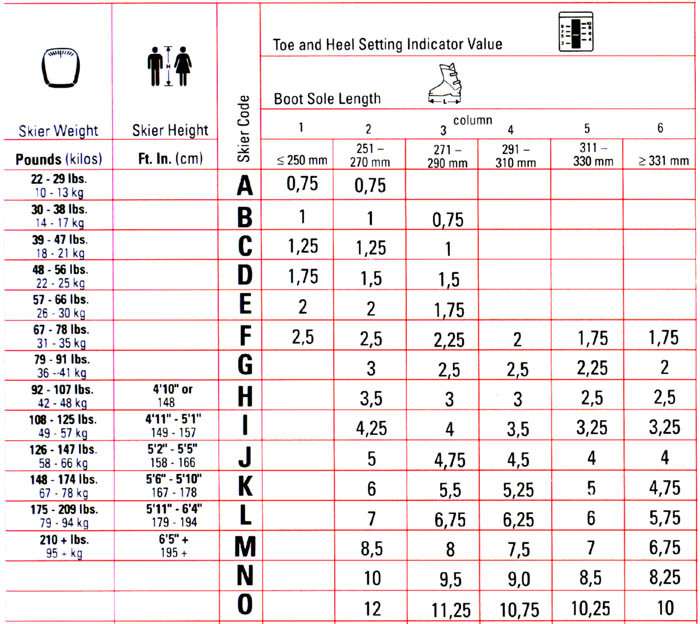 You may download a PDF of the Salomon Shop Practices Manual, which contains a DIN chart.